The Premium Series high pressure fog pump range includes a low speed 4 pole motor for quieter operation. Because this range includes an oversized bare pump and a pulley driven design, the operating speed of the bare pump is kept to a minimum thereby reducing noise and vibration while maintaining the proper pressure and flow requirements of the unit. The Premium range high pressure pumps are industrial duty outdoor rated units designed for 24/7 use under normal operating conditions. This range is ideal for all industrial and commercial applications when quality, versatility, safe and convenient operation are the primary considerations. All Premium Pumps carry a 3 year warranty. The numbers in center of table show the minimum & maximum number of nozzles that should be used with the corresponding pump model. The Professional Series pump range is our direct drive pump product and is designed for 115V and 230V 60 Hz. The Professional Series pump provides both quality and value. This range is our most economical solution to many fog system applications. This range includes an inlet solenoid valve, a low water safety switch, a glycerin filled pressure gauge, a thermal relief valve, and an adjustable pressure regulator with bypass. The safety switch ensures the safe operation of the pump and eliminates premature seal failure by preventing the pump from running without sufficient water supply. The Professional range pumps are heavy duty outdoor rated units designed for 8hours operation per day, seven days a week under normal operating conditions. This range is ideal for both residential and commercial applications where price and value are the primary considerations. The range is designed for single zone applications. 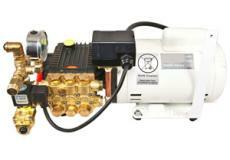 All professional Series pumps carry a 2 year warranty. Consult our Customer Service Department for details and assistance. The Certified Series pump range includes our pulley drive and direct drive products designed for 115V and 230V 50 Hz. This Series is CE certified for distribution within the European Union. The pulley driven pump range is assembled within a treated and powder coated enclosure with an inlet solenoid valve, an adjustable pressure regulator with bypass, thermal relief valve, hour meter, glycerin filled pressure gauge, and low water safety switch. The safety switch ensures the safe operation of the pump and eliminates premature seal failure by preventing the pump from running without sufficient water supply. All Certified Pumps carry a 3 year warranty. The Direct Drive pump range includes an inlet solenoid valve, a low water safety switch, a glycerin filled pressure gauge, a thermal relief valve, and an adjustable pressure regulator with bypass. The range is designed for single zone applications. The direct drive pumps are the preferred choice for applications when quality and value are the primary considerations.